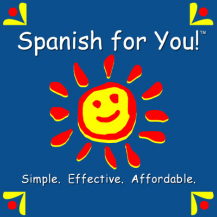 My Java with Jesus: Review: Spanish for You! I have to admit, when I found out I was going to review Spanish for You! by Debbie Arnett I wasn't exactly thrilled about the idea of adding it to our homeschool curriculum...not because I don't think it's a necessary skill for today, rather we've been so busy during the past month that fitting it in was just one more thing I had to do. When we started homeschooling we decided to use a French curriculum because my daughter absolutely loves Fancy Nancy books. So I had some concern of the overlap as well. In high school I took 2 years of Spanish and 3 years of French and there are some similarities to the languages, which I thought would be confusing to her. However, my daughter (who is in 2nd grade) transitioned much better than I expected. And she was much more thrilled to be learning it than I was to be teaching it (shame on me, I know)! The layout for the lessons is slightly confusing at first, but once you take some time as the parent to familiarize yourself with it, you are off and running. It comes complete with 30 weeks of lesson plans (everything is laid out for you...YAY!! ), Spanish audio (both the author and a native speaker, which is slightly harder to understand) and a textbook (unless you order the e-book...which is what I reviewed). I personally loved the e-book and not having to keep up with another book for our homeschool. As the teacher, it doesn't take a great deal of effort on your part. It is set up so that the student for them to be able to work on it independently. My daughter needed a little extra help, so I had to be a little more involved. It's also designed to be taught for 4 days a week, however we cut it back to two days a week which is how we were doing our French. The price is very affordable, especially compared to some of the other programs on the market. It's fun for the whole family. We made flash cards just like the curriculum suggested and used them all the time. My daughter thoroughly enjoyed being able to carry on a mini conversation after the first couple lessons. Overall, I feel the curriculum was extremely easy to use and adaptable to any situation. My favorite part was that the lesson plans were laid out for me. There was a slight issue with the audio files organization, however, those have been addressed and reorganized for future users! Or purchase here...there's an option for all your needs. Any package you purchase includes soft cover book, lesson guides, worksheets, flash cards/activity pages. You can purchase Grades3-8 for $64.95 or you can break it down to Grades 3-4 or 5-6 or 7-8. Each grade level is $39.95. Any extra books you will need are $12.95. Head on over here for some free mini lessons to see if it's a fit for your family as well! Need a second opinion...then check out reviews by other Mosaic Reviews team members here.